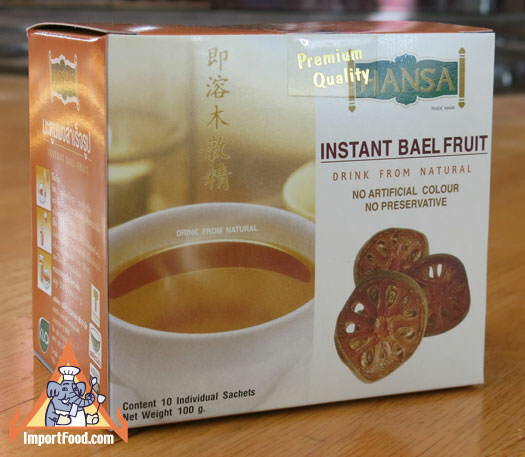 Premium quality Hansa brand Thai instant bael fruit tea. It's a delicious drink with some common health benefits. Bael fruit is known to help heal internal wounds and disinfect the stomache (gastric system). We love the exotic flavor of this drink alone or after adding a few drops of fresh lime juice. Simply add hot water and stir. This product has the prestigious Shell Shuan Shim award. Ingredients: 55% bael fruit , 45% sugar. No artificial flavor or preservative. 10 foil sachets, 10 gram per sachet. We also offer Hansa brand ginger drink.